chez zero: Who have we here? Yesterday morning this was not outside my door, and then a few hours later it was. Well, hello! 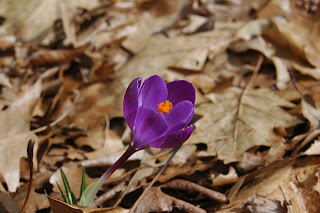 Little Crocus, you are most welcome here. Invite all your friends, too, because all the gray and blah outside is a serious downer. 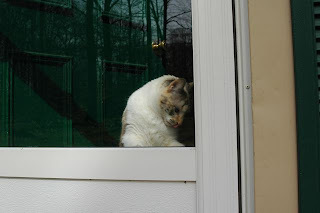 And here's someone who got mad that she wasn't allowed outside for the photo shoot in the sunshine.